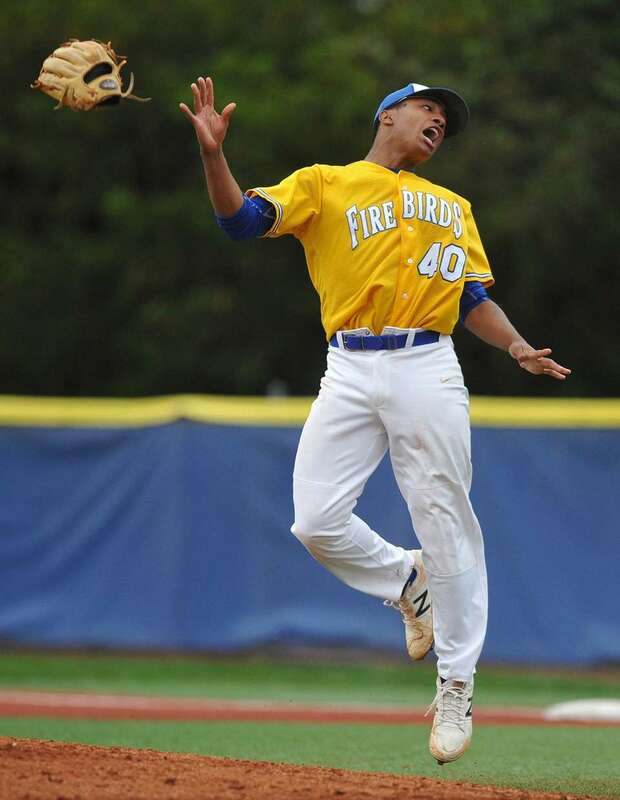 A collection of some of the best high school sports photos from around Long Island in the month of May 2017. 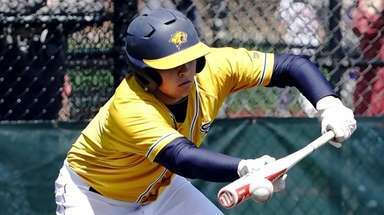 Nick Collins, Massapequa pitcher, delivers to the plate in the bottom of the seventh inning in Game 3 of the Nassau baseball Class AA final against Plainview JFK at SUNY Old Westbury on Tuesday, May 30, 2017. 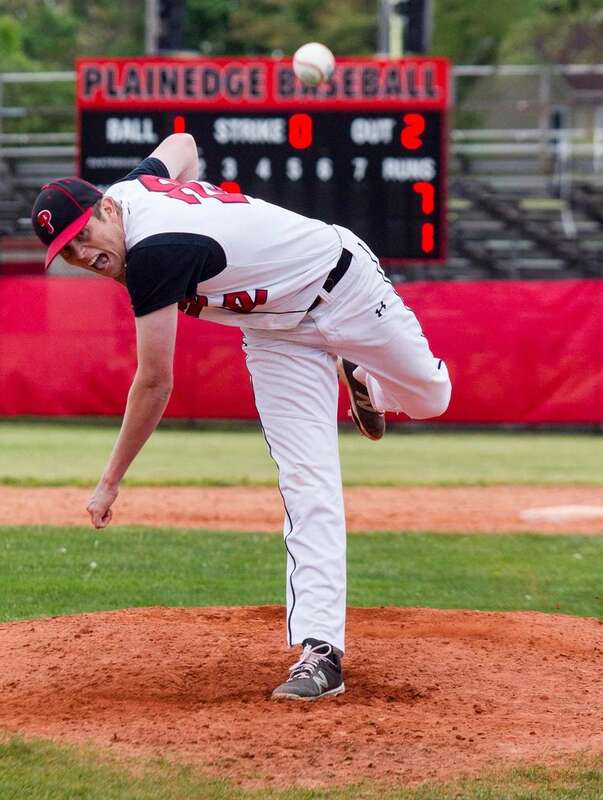 He pitched a shutout to lead the Chiefs to a 4-0 win. 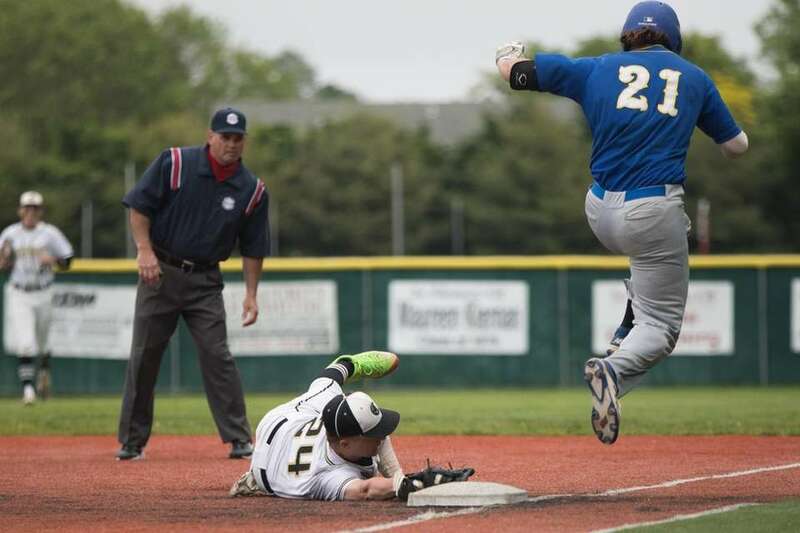 Jake Krzemienski of Commack just misses tagging Kevin DiCapua of West Islip out during Game 1 of the Suffolk baseball class AA finals at St. John's the Baptist High School in West Islip, May 30, 2016. Wantagh players celebrate their win during the Nassau Girls Class A lacrosse championship against Cold Spring Harbor on Wednesday May, 31 2017 at Adelphi University. 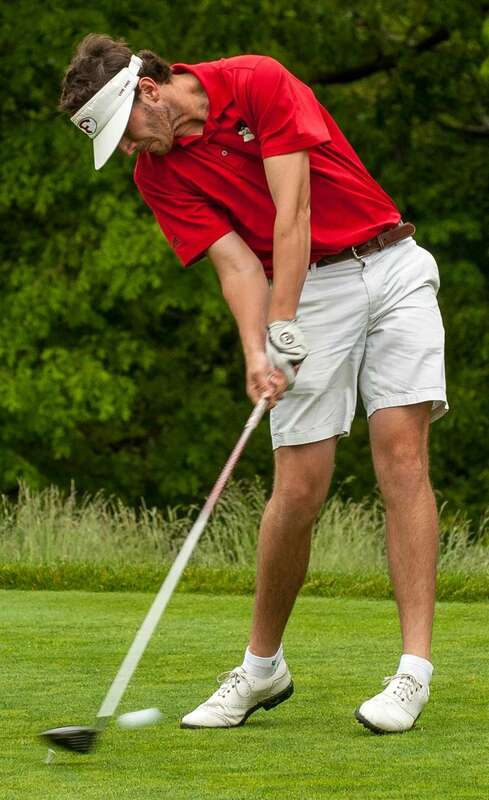 Friends Academy golfer Will Parker makes contact with the ball during the Long Island Boys Team Championships, held at Bethpage State Park Black Course, Farmingdale, New York, on Wednesday May 31, 2017. Members of the Eastport-South Manor girls lacrosse team celebrate after their win over Rocky Point in the Suffolk Class B championship on Tuesday, May 30, 2017 at St. Joseph's College Athletic Center. 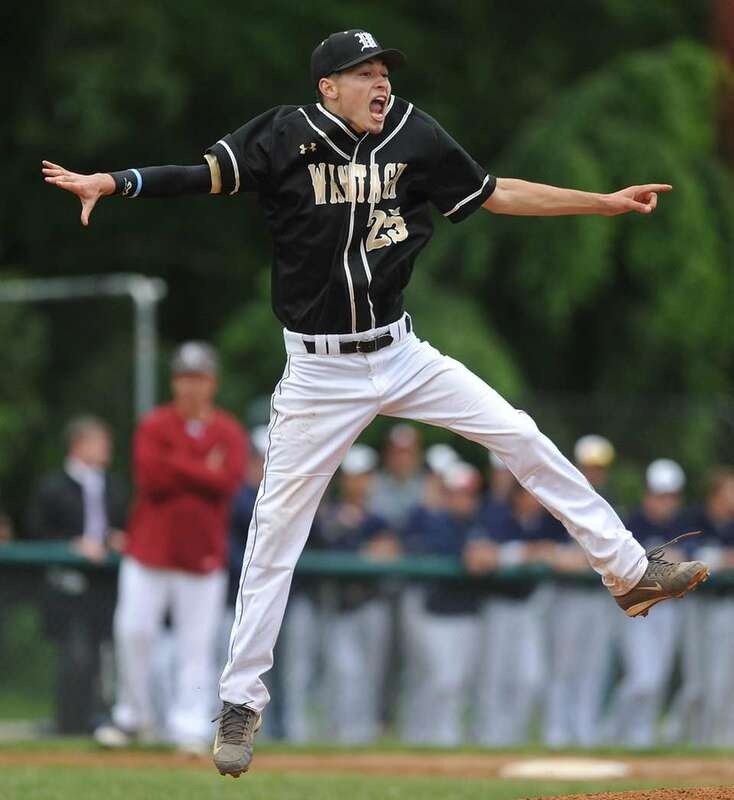 Brendan Haas, Wantagh pitcher, reacts after the final out in Game 3 of the Nassau baseball Class A final against Garden City at SUNY Old Westbury on Tuesday, May 30, 2017. He pitched a complete game. 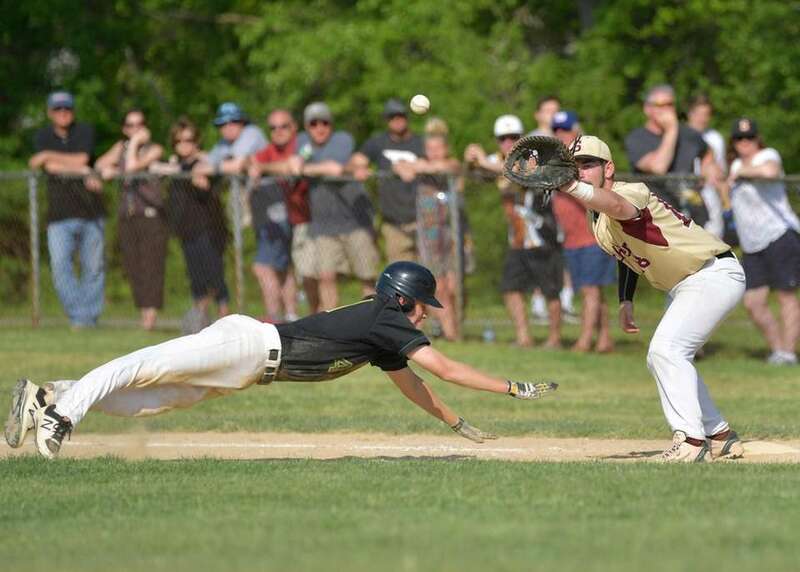 Wantagh won 4-2 to take the best-of-three series two games to one. 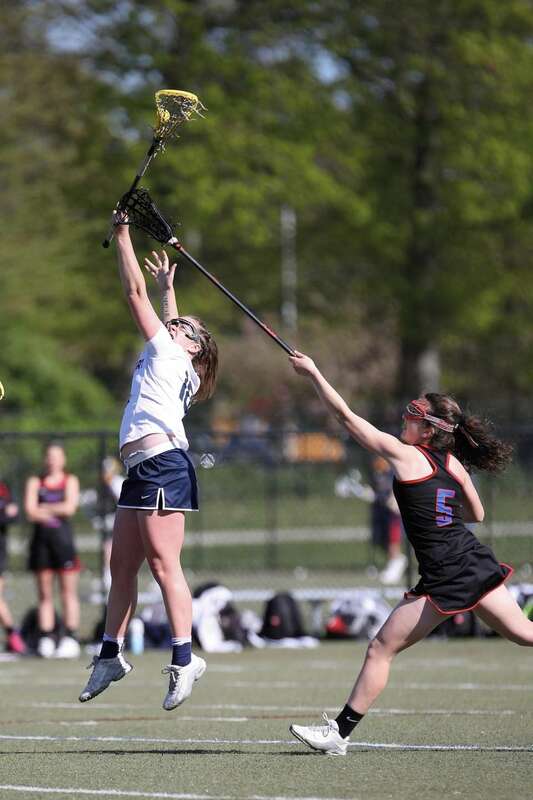 Bayport-Blue Point midfield Kyla Zapolski (4) scores while falling down during the first half of the Class C game on Tuesday, May 30, 2017 at St. Joseph's College Athletic Center. Garden City's Jackie Brattan (3) and Celia Concannon (8) celebrate their Nassau Class B girls lacrosse championship win over Long Beach on May 31, 2017 at Adelphi University. Massapequa catcher Andrew Primm hangs on to the ball after tagging out Plainview-Old Bethpage JFK's Mark Faello for unconventional 5-4-2 double play to end the bottom of the third inning in Game 3 of the Nassau baseball Class AA final at SUNY Old Westbury on Tuesday, May 30, 2017. 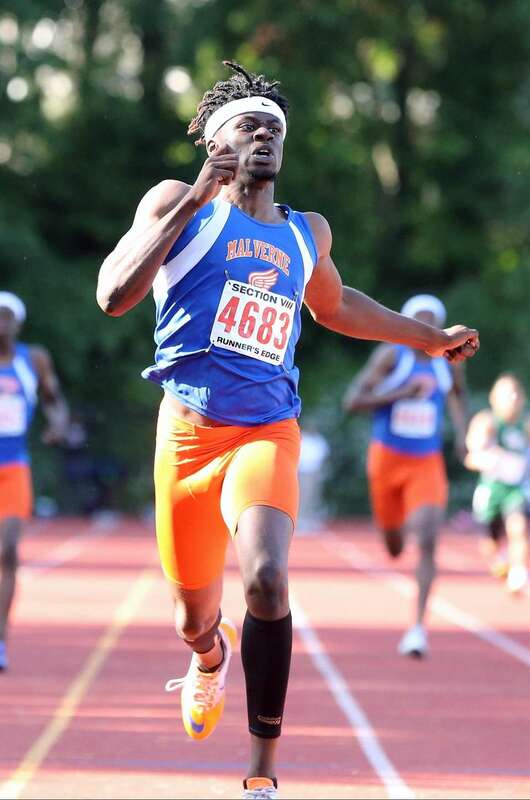 Malverne's Maurice Teachey Jr. takes first in the boys 400 meter division 2 race during the Nassau individual track championships/state qualifier at Glen Cove High School on May 31, 2017. 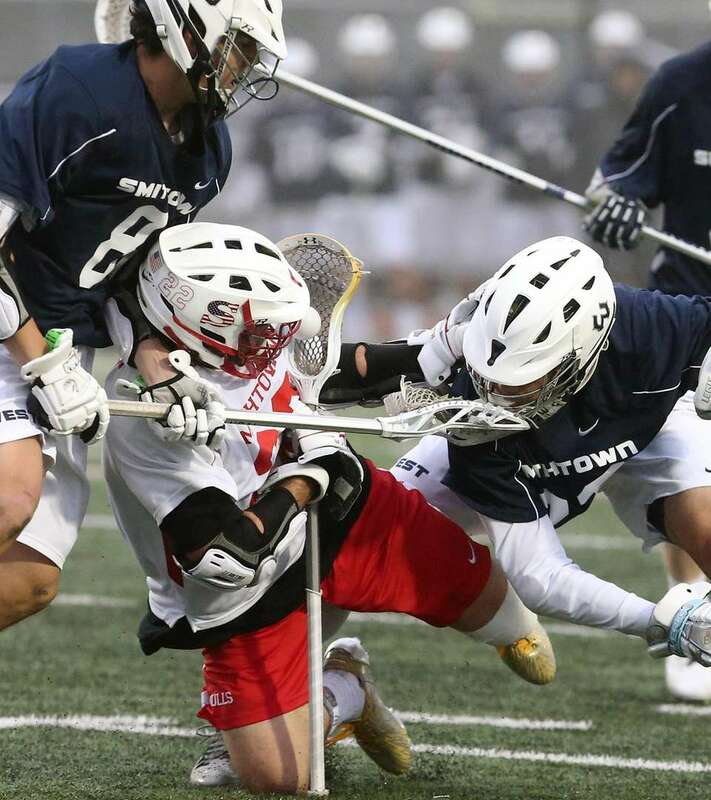 Smithtown West's defenders work together against Smithtown East's Connor Desimone during the Suffolk High School boys lacrosse Class A semifinals on May 25, 2017. Mount Sinai's starting pitcher Emma Wimmer delivers a pitch in the first inning on Saturday, May 27, 2017. 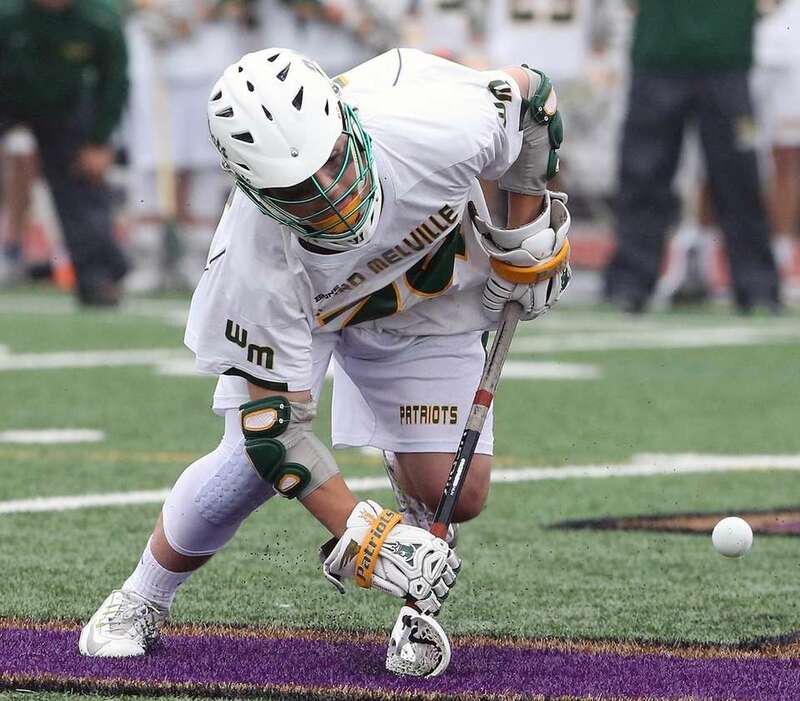 Ward Melville's Michael Giaquinto scrambles for the ball during the Suffolk boys lacrosse Class A semifinals where Ward Melville defeated Half Hollow Hills East, 15-6, at Islip High School on May 25, 2017. 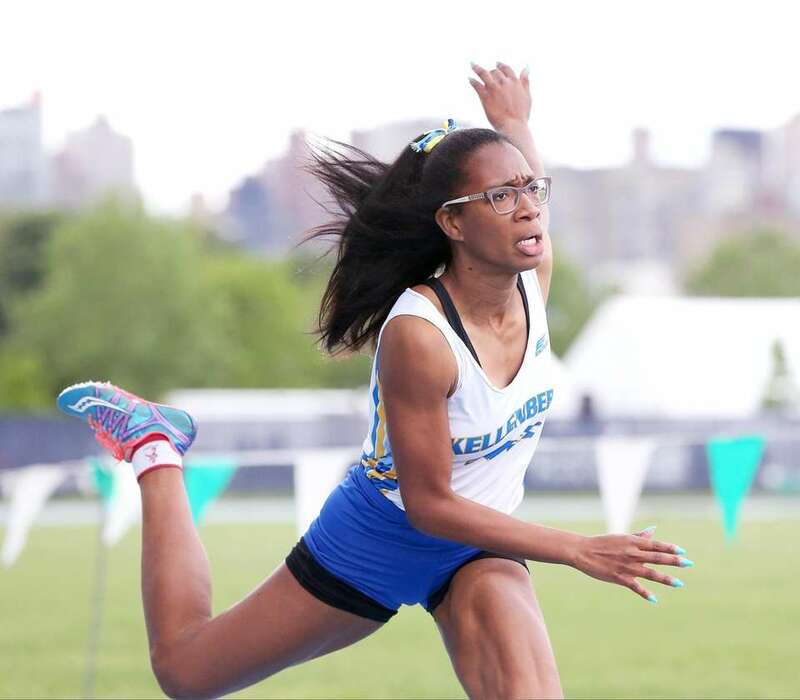 Kellenberg's Gillian Blackwood takes second in the girls 100 meter hurdles in a time of 15.48 during the CHSAA Intersectional High School track championships at Icahn Stadium in New York on May 27, 2017. Akajia Atkins of Copiague competes in the long jump during the Suffolk Girls Track & Field Championships on Friday, May 26, 2017. 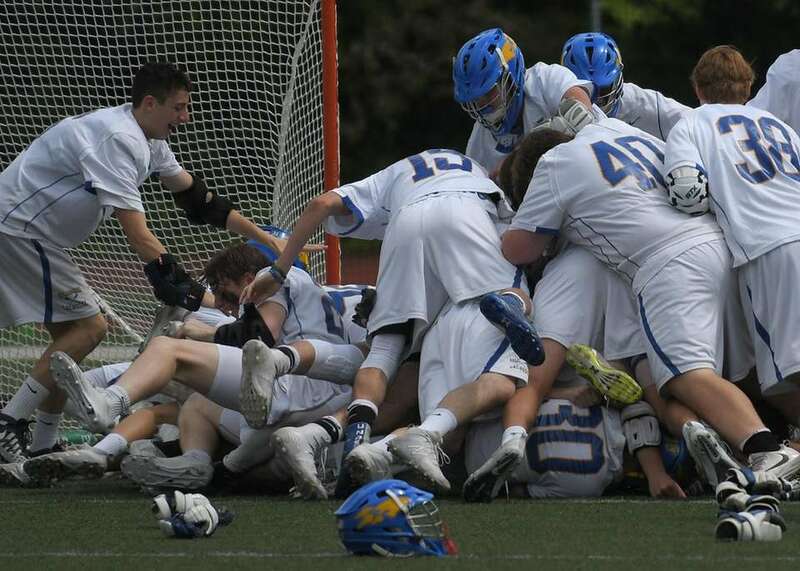 Kellenberg teammates celebrate after their 11-9 win over Iona Prep in the CHSAA boys lacrosse Class AA Intersectional Final at Kellenberg High School on Friday, May 26, 2017. Kellenberg's Jason Diaz reacts after striking out the final batter in the Nassau-Suffolk CHSAA baseball championship against St. John the Baptist at Hofstra University on Monday, May 29, 2017. 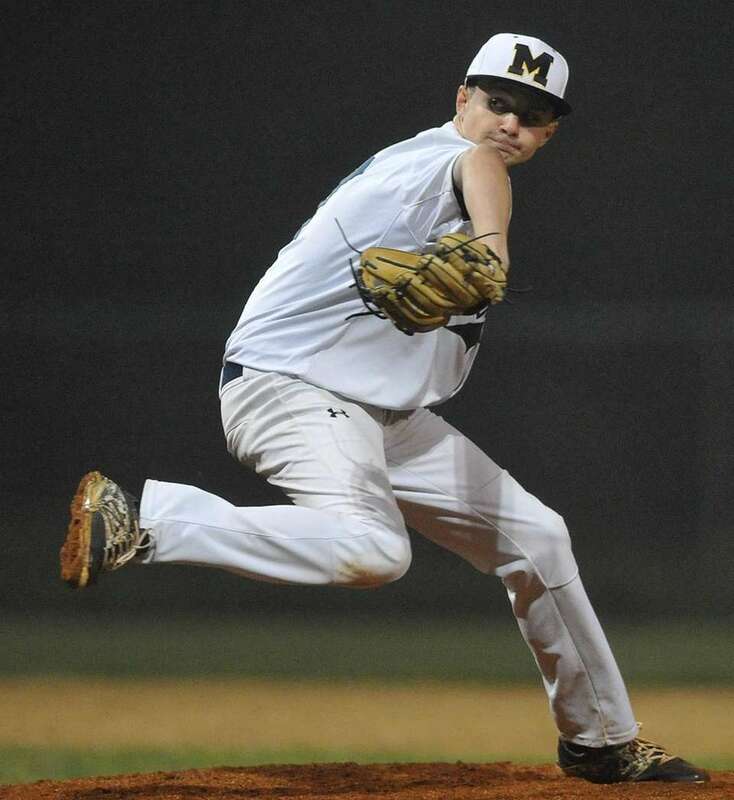 He tossed a shutout in Kellenberg's 1-0 win. Siara Guevara of Miller Place wins first place with a time of 15.79 in the Division Three 100 Meter Hurdles during the Suffolk Girls Track & Field Championships on Friday, May 26, 2017. Shoreham-Wading River runners compete in the Division Three 1500 Meter Run during the Suffolk Girls Track & Field Championships on Friday, May 26, 2017. Daniel Claxton of Smithtown East clears 7'0" at the Suffolk Division 2 boys track and field championships at Comsewogue High School on Wednesday, May 24, 2017. Christian Oakley of Southampton won his heat in the 800 meter at the Suffolk County Boys Track Division Championships at Comsewogue High School on May 22, 2017. 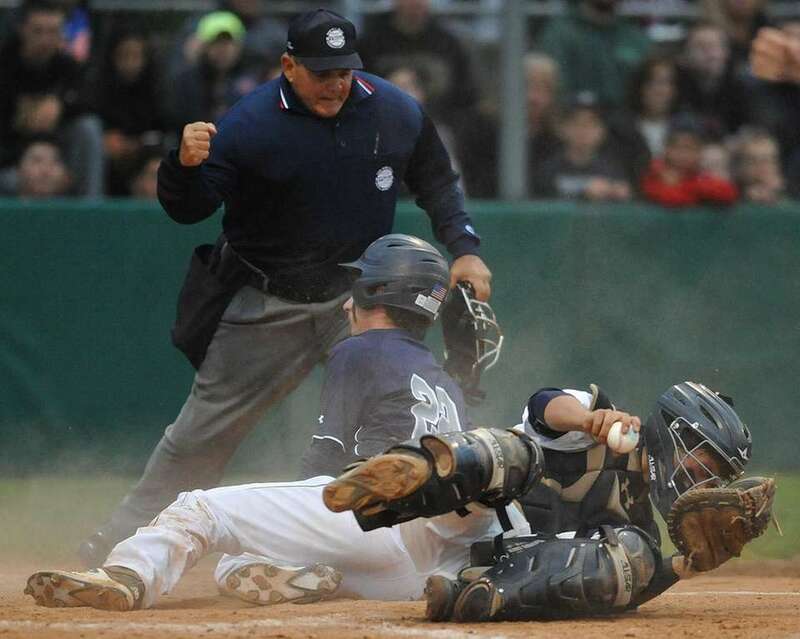 Bayport-Blue Point's Matt LeStrange is safe at second as Shoreham-Wading River's Kyle Baylous is drawn off the bag in the fourth inning on Wednesday, May 24, 2017. Lawrence Leake of Huntington wins the high hurdles at the Suffolk Division 2 boys track and field championships at Comsewogue High School on Wednesday, May 24, 2017. Farmingdale's Joe Simons takes a shot in the fourth quarter while being covered by Syosset's Daniel Ochs (13) and Joseph Cawley (42) during the Nassau County Boys Class A semifinal lacrosse game on Wednesday May, 24 2017 at Hofstra. Sacred Heart's Marissa Braito (16) is called out with the tag by Kellenberg's Megan Harvey during the CHSAA softball semifinals on Tuesday, May 23, 2017. 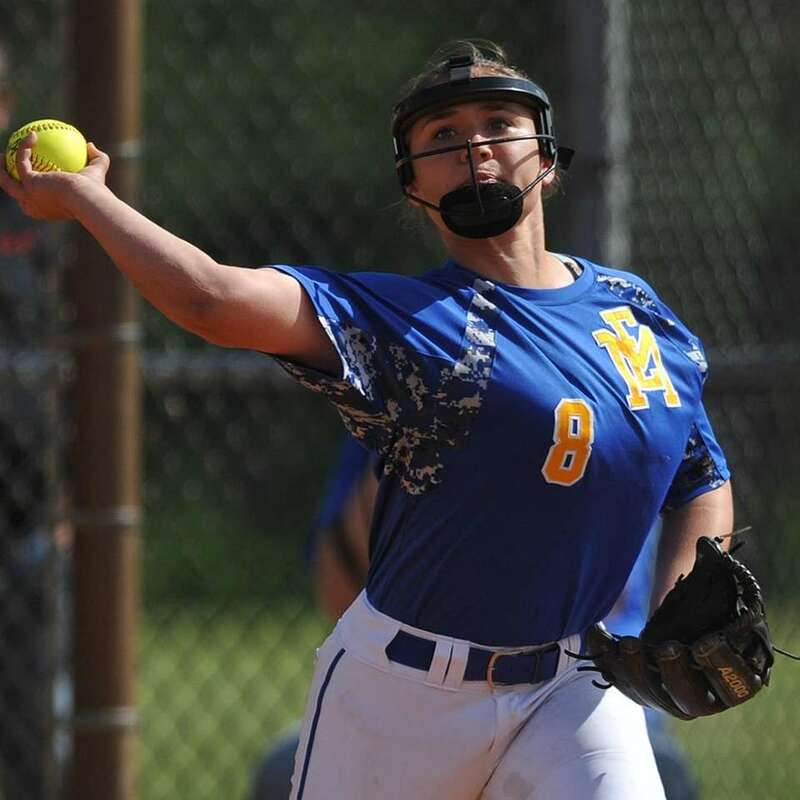 Amy Mallah, East Meadow third basewoman, throws to first base for an out during Game 2 of the best-of-three Nassau County softball Class AA final against Long Beach at Mitchel Athletic Complex on Wednesday, May 24, 2017. Jon Meyer of Lindenhurst returns a volley in his win at the Suffolk boys and girls badminton individual/doubles championships at Half Hollow Hills East High School in Dix Hills on Tuesday, May 23, 2017. 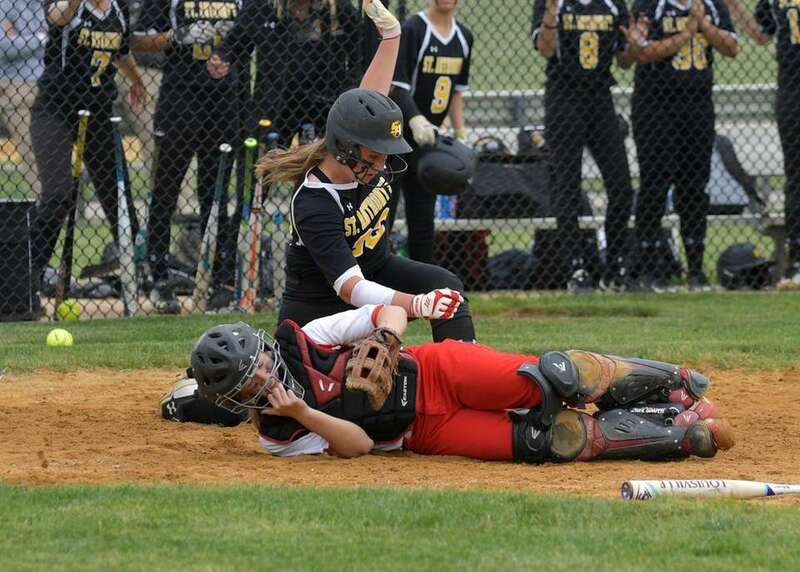 St. Anthony's Taylor Zaytk is called safe after colliding with Sacred Heart's Kate Karamouzis during the CHSAA Softball Championship game on Tuesday, May 23, 2017. East Islip's Jackie Carey (7) connects for a double and 2 RBI's late in the 4th inning of the softball playoff game against Commack on Saturday, May 20, 2017 at East Islip High School. 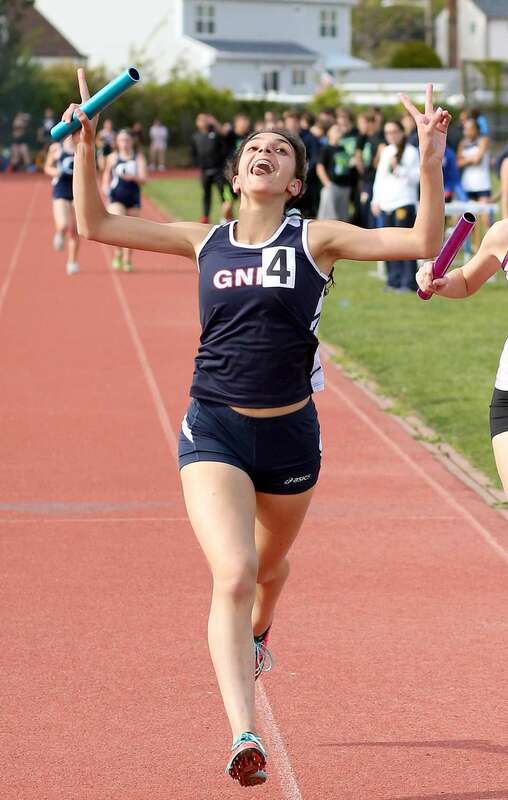 Halle Hazzard of St. Anthony's sprints to victory in the girls 200 meter dash during the Nassau-Suffolk CHSAA track and field league championships at St. Anthony's High School on Saturday, May 20, 2017. She posted a time of 24.88 in the event. 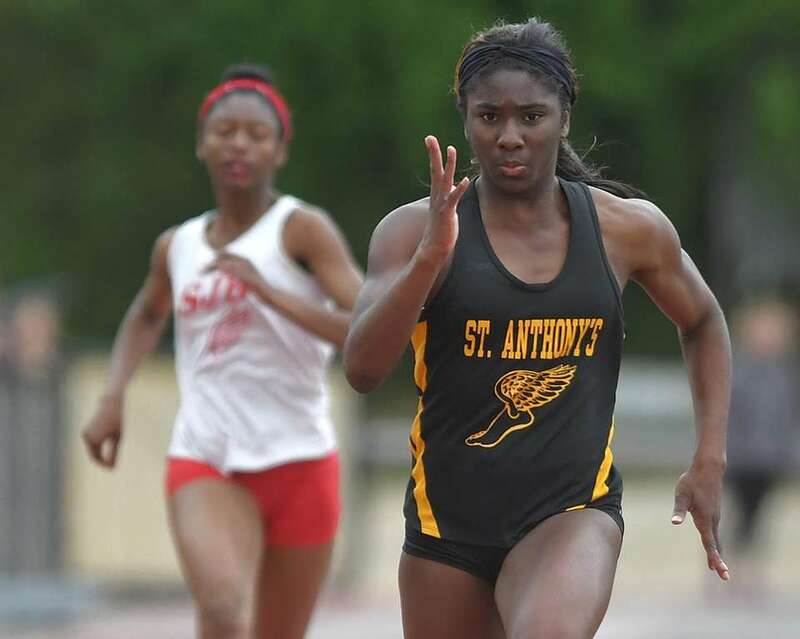 She also won the girls 100 meter dash (11.81). Plainedge's no. 22 Sean Mendyk pitches in relief during the Nassau Class A playoff game against Division on Saturday, May 20, 2017. 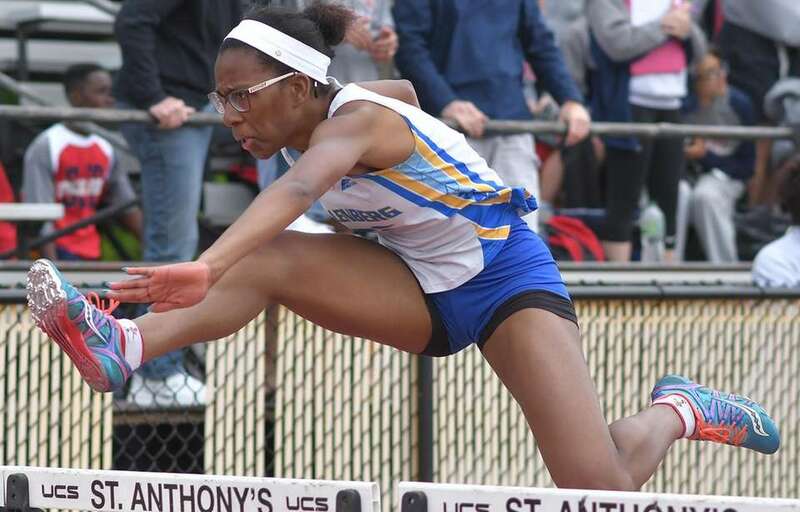 Gillian Blackwood of Kellenberg clears the final obstacle on her way to victory in the girls 100 meter high hurdles during the Nassau-Suffolk CHSAA track and field league championships at St. Anthony's High School on Saturday, May 20, 2017. She posted a time of 15.30 in the event. East Islip's Allison Franzese's cleats tell the story of this year's effort after the 2016 season loss in the county championships. 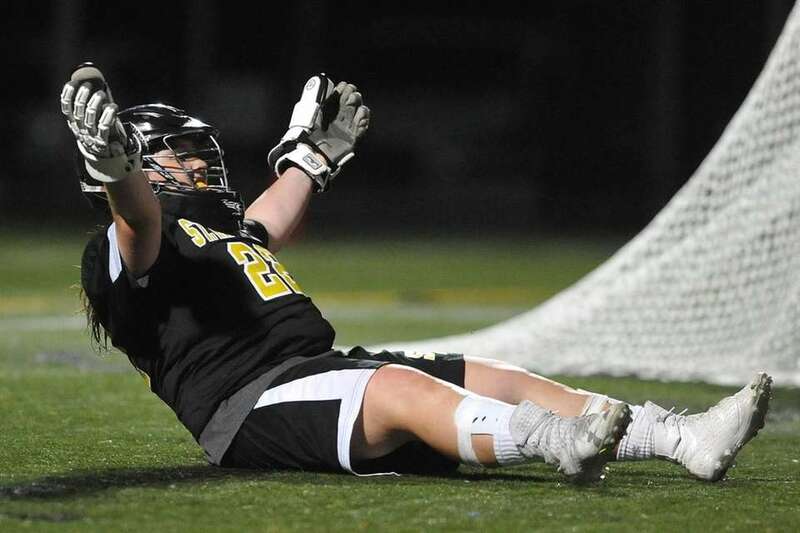 Dan Mallay of South Side beats his Wantagh defender to shoot and score the winning goal in a Nassau Class B boys lacrosse playoff game on Thursday, May 18, 2017. Joe LiCalzi of South Side looks on during halftime against Wantagh in a Nassau Class B boy's lacrosse playoff game on Thursday, May 18, 2017. Delaney Galvin, St. Anthony's goalie, reacts after her team's 11-7 win over Sacred Heart Academy in the Nassau-Suffolk CHSAA girls lacrosse Class AAA final at Adelphi University on Thursday, May 18, 2017. Ward Melville's Logan Cronin dives back to 1st on the throw to Matt Murray during the CLASS AA baseball playoff game between Sachem East and Ward Melville held on Thursday, May 18, 2017 at Ward Melville High School. Nick DeMaria of Kellenberg returns a shot to Alvaro Bezos of the St. John the Baptist during the tennis match on May 17, 2017. 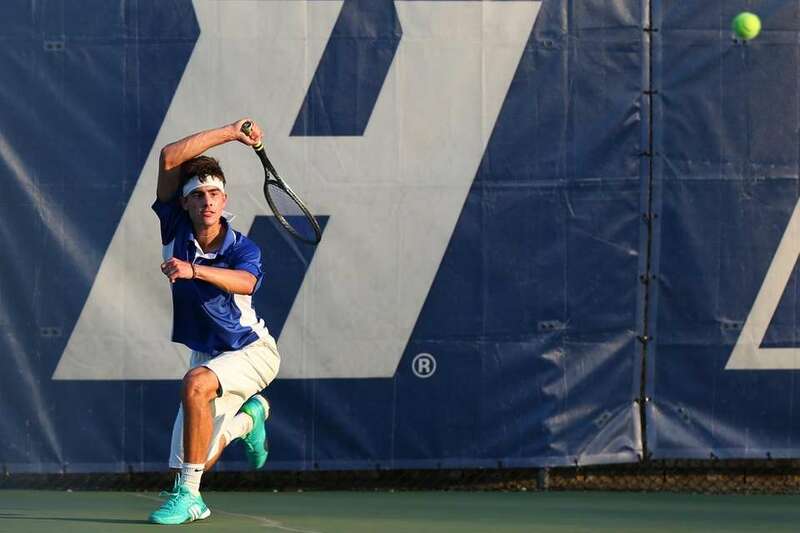 Bezos defeated DeMaria, 6-4, 7-5. Port Washington's James Dalimonte (#22, front) and Baldwin's Mike Conforti (#14) during the Nassau High School Boys Lacrosse Class A first round playoff game held on Tuesday, May 16, 2017. Long Beach's Katie Frisch reacts to the close call in the Nassau Class AA softball semifinals in Long Beach on Tuesday, May 16, 2017. 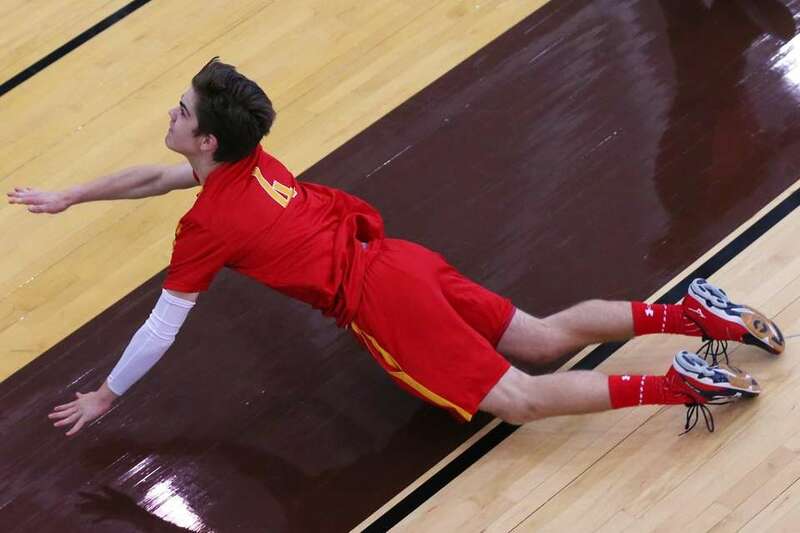 William Sanchez of the Chaminade dives to make a return to the St. John the Baptist during the volleyball match on May 16, 2017. 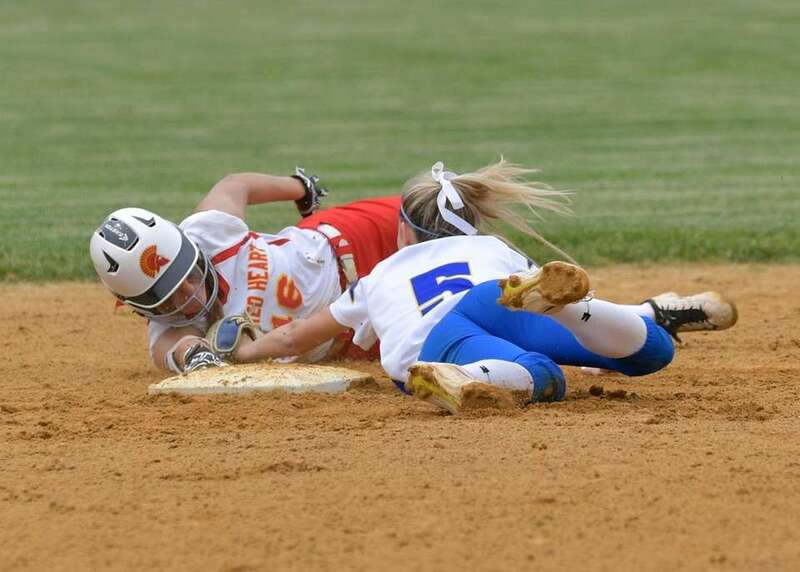 Massapequa catcher Ellie Egher puts the tag on Katie Frisch of Long Beach in the Nassau Class AA softball semifinals in Long Beach on Tuesday, May 16, 2017. 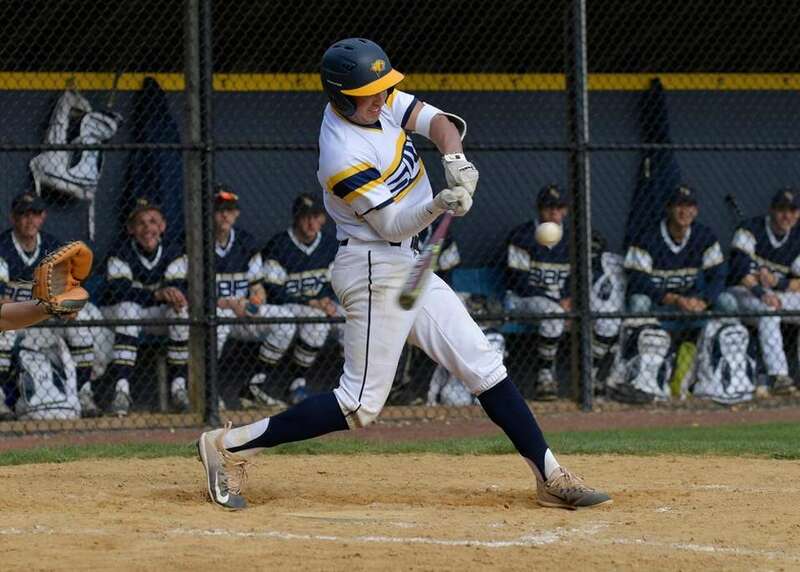 Massapequa evened the series 1-1 with a 7-5 win. 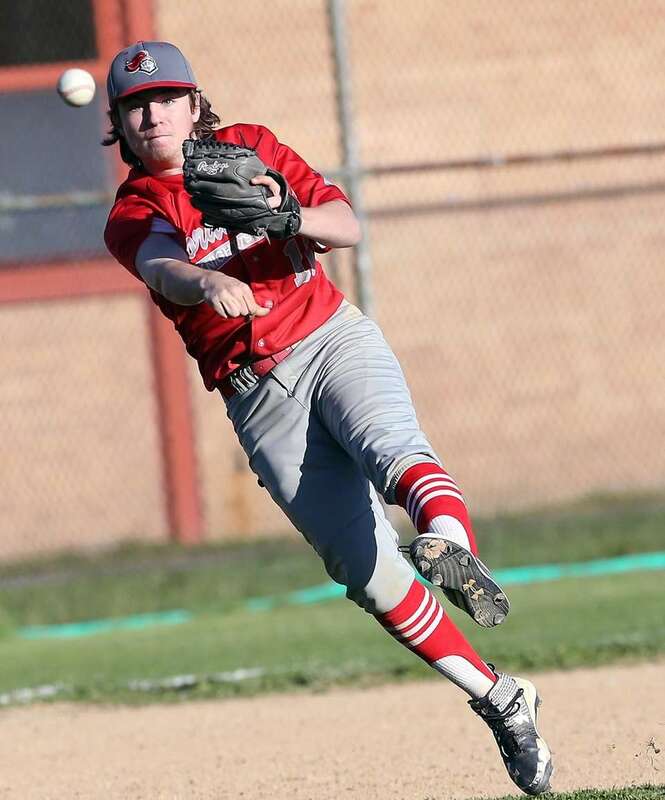 Floral Park's Chris Leary tries for the out at first during the Nassau High School baseball Class A first round playoff game on May 15, 2017. 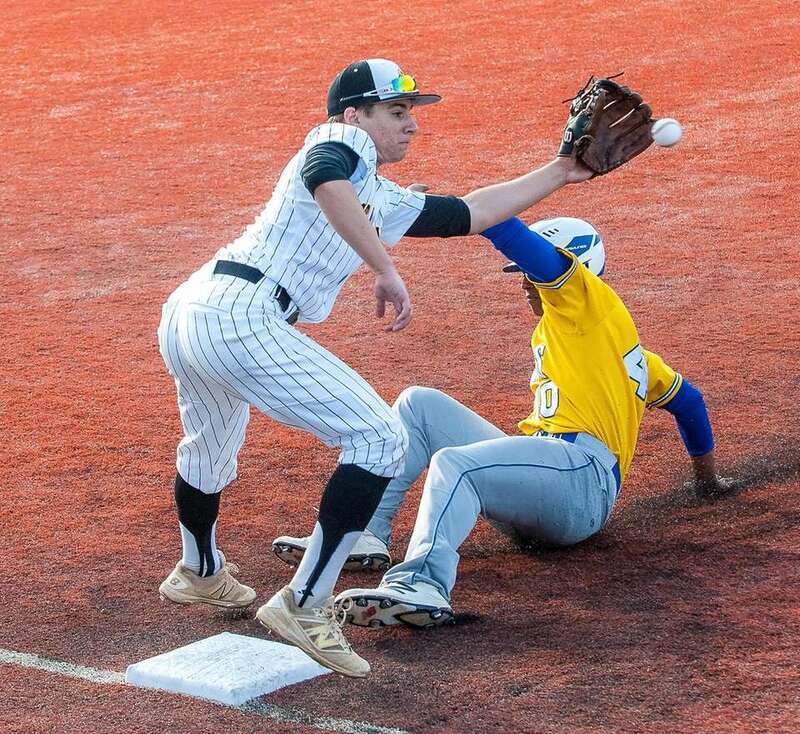 Division's Brandon O'Brien make the final out at first in the first round of Conference A playoffs. Division went on to beat MacArthur by a score of 5-1 in Levittown on Monday, May 15, 2017. 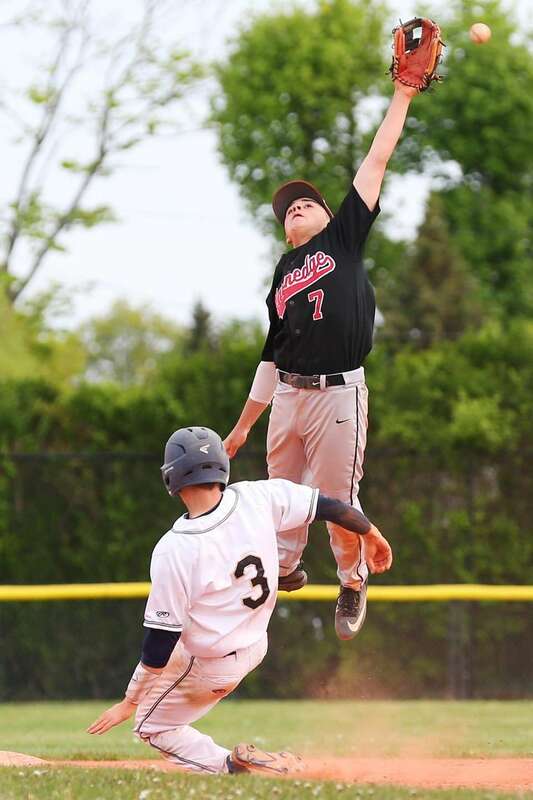 MacArthur's make the unassisted out at first in the first round of Conference A playoffs. Division went on to beat MacArthur by a score of 5-1 in Levittown on Monday, May 15, 2017. Seaford's A.J. 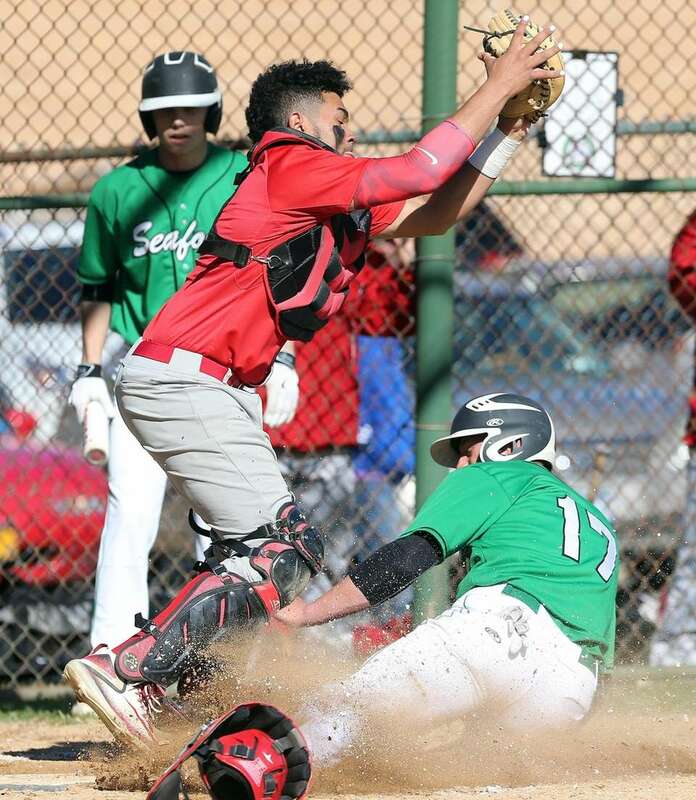 Cain slides in under tag by Floral Park's Justin Rahaman during the Nassau High School baseball Class A first round playoff game where #16 Floral Park defeated #1 Seaford 5 to1 at Seaford High School in Seaford, New York on May 15, 2017. 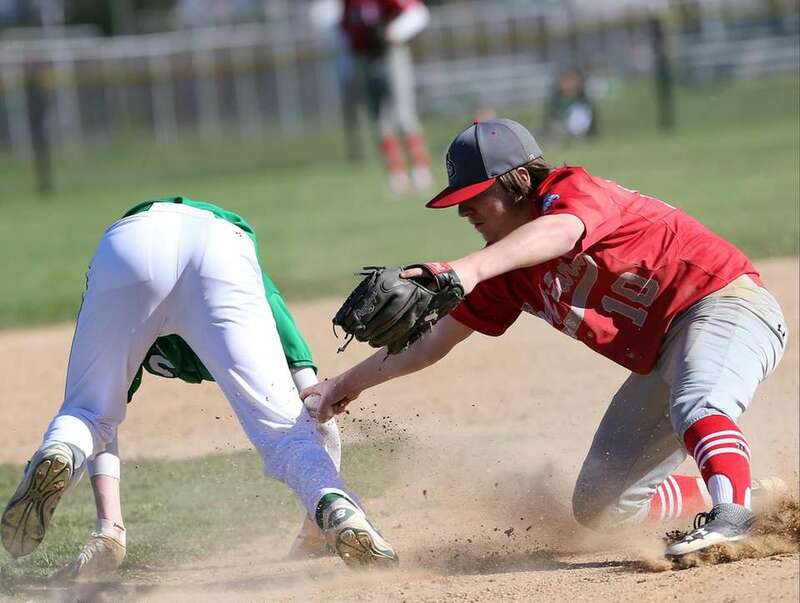 Floral Park's Chris Leary tags out Seaford's Carter Skretch in a run down during the Nassau High School baseball Class A first round playoff game where #16 Floral Park defeated #1 Seaford 5-1 on May 15, 2017. Klaire Klemens of West Islip runs the water hazard in the 2000 meter steeplechase, ahead of Nicole Abbondandelo of Huntington, at the rain soaked North Shore Invitational track meet in Glen Head on Saturday, May 13, 2017. Rosalie Paglia of Ward Melville competes in the shot put at the rain soaked North Shore Invitational track meet in Glen Head on Saturday, May 13, 2017. Kellenberg's Jason Diaz slides in safe at third base ahead of a tag from St Anthony's Robbie Affenita on Friday May 12, 2017. Nicole Schneider (left) of North Shore and Klaire Klemens of West Islip are exhausted after their 3000 meter run at the rain soaked North Shore Invitational track meet in Glen Head on Saturday, May 13, 2017. 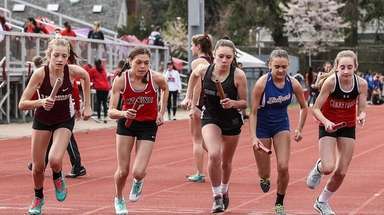 Great Neck North's Alexis Namdar takes her team to a first place finish in the distance-medley relay at the Massapequa Under the Lights track and field Invitational at Massapequa High School in Massapequa, New York on May 12, 2017. 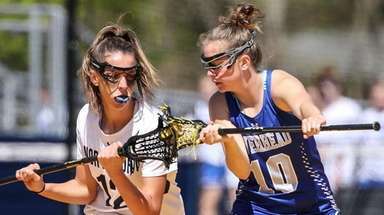 Smiththown East's Alayna Costa and Riverhead's Megan Kielbasa get ready for a faceoff in the second half on Wednesday May 10, 2017. 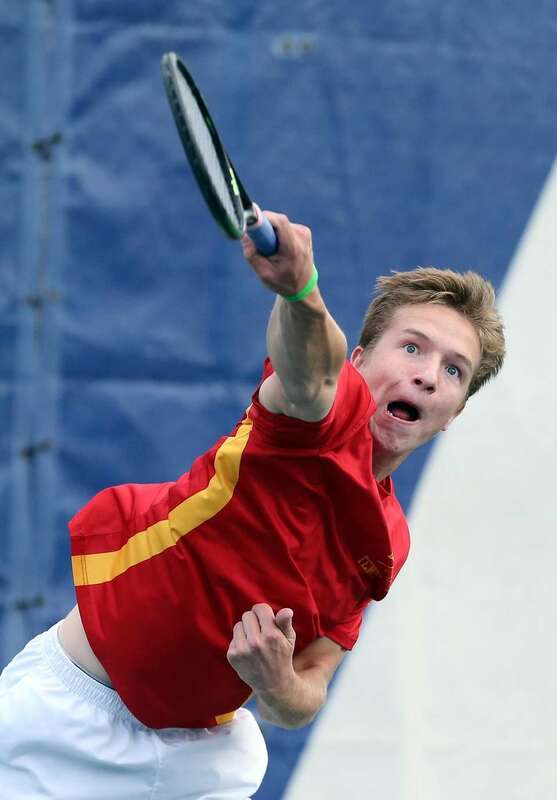 Chaminade's 2nd singles player George Rettaliata defeated St. Anthony's Emilio Niland, 6-2, 7-6 (9-7) in the CHSAA boys tennis team final at Hofstra on May 10, 2017. 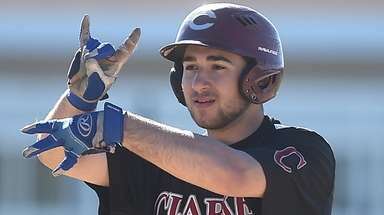 Shoreham's Nick Manesis is greeted at home after hitting a three-run homer to left field in the top of the third inning on Wednesday, May 10, 2017 at Miller Place. 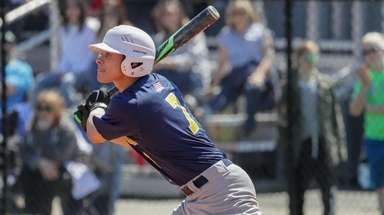 Shoreham Wading River's Brian Morrell connects for a single against Bayport-Blue Point on Thursday, May 11, 2017. Bayport-Blue Point's Cassidy Weeks #14 ducks under the stick of Jenna Harcelrode #21 on her way to a goal during the second half of Bayport-Blue Point's victory over Sayville on May 11, 2017. 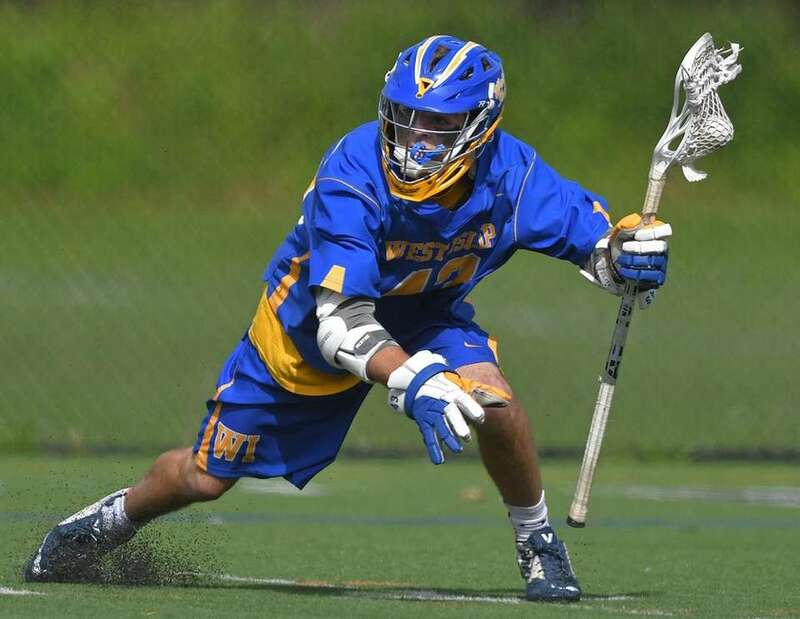 Joe Diggle of West Islip kicks up some turf as he maneuvers behind the net during a boys lacrosse game against host Half Hollow Hills East on Tuesday, May 9, 2017. Hills East won, 14-10. Rocky Point's Matt Labaski is unable to get to a long fly ball hit by Sayville's Brock Murtha for a double at Rocky Point High School on May 9, 2017. Sayville's Brock Murtha advances to third on a wild pitch as Rob Milopski tries to make the tag during Rocky Point's victory over Sayville at Rocky Point High School on May 9, 2017. Sayville's Jake Sheridan makes a running catch against Rocky Point on May 9, 2017. Central Islip varsity softball game against Connetquot High at Central Islip High School on May 9, 2017. Sayville's Ryan Alexandersen makes a running catch in the third inning during a game at Rocky Point on Tuesday, May 9, 2017. Ward Melville's Logan Doran makes the throw over the umpire's head to get the last out of the inning against Patchogue-Medford on May 8, 2017. 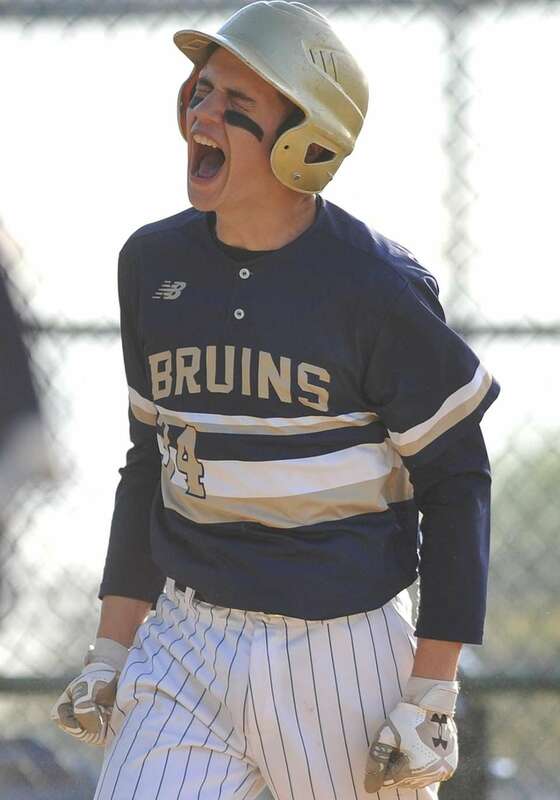 Allan Drew, Baldwin first baseman, reacts after crossing home plate in the top of the sixth inning against host Plainview JFK Old Bethpage on Monday, May 8, 2017. Baldwin won, 8-3. Ward Melville's Joseph Roselli hits a two-run homer during the first inning of Patchogue-Medford's victory over Ward Melville on May 8, 2017. Patchogue-Medford celebrates after the final out of their victory over Ward Melville at Patchogue-Medford High School on May 8, 2017. Northport's Meghn Smith (18) controls the draw in the first half against Middle Country's Jennifer Barry at Veterans Memorial Park in East Northport on May 8, 2017. Middle Country won, 14-5. Chaminade's Regan Quinn gets sandwiched between Gillen Caliendo (6) and Edward Arnold of Manhasset in a non-league game played in Mineola on Saturday, May 6, 2017. Manhasset won 8-7. Brendan McCaffrey of Commack High School placed third in the broad jump during the morning session of the Suffolk High School football combine at Sachem North High School on May 7, 2017. 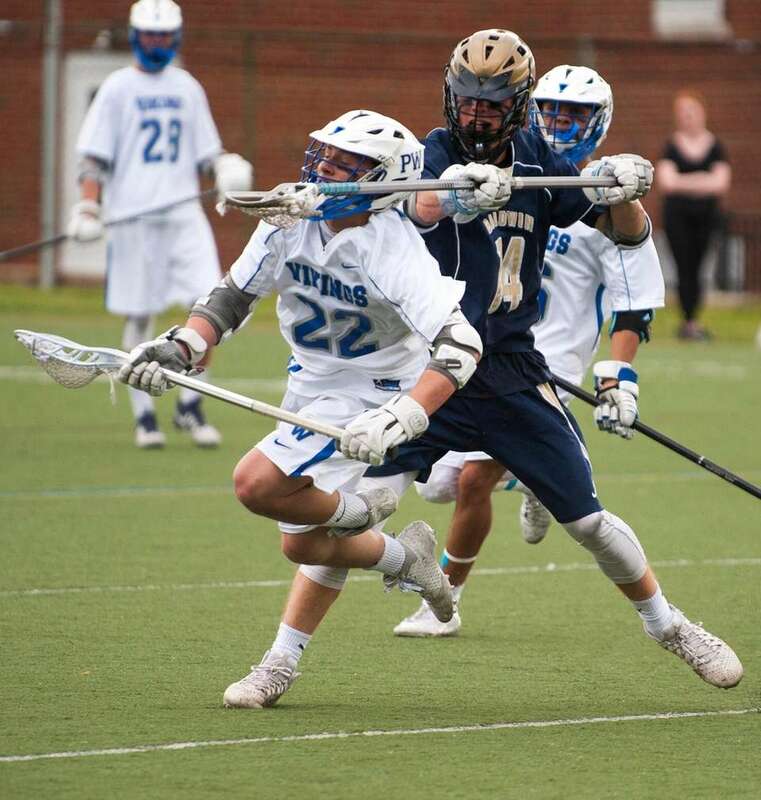 Garden City's Kyle Steinbach (10) wins the faceoff against Shoreham's Joseph Miller (56) during the first half on Saturday, May 6, 2017 at Shoreham-Wading River High School. Ishmael Lamarque of Roslyn wins the triple jump during the Seahawk Invitational track meet on Thursday May 4, 2017 at Cold Spring Harbor High School. Julia Bryant of Kellenberg goes over a hurdle on her way to winning the 1000M Steeple Chase during the Seahawk Invitational track meet on Thursday May 4, 2017 at Cold Spring Harbor High School. Carmine Szynal of Bethpage slides under the throw to second base against Nick Cavallo of Plainedge on May 4, 2017. 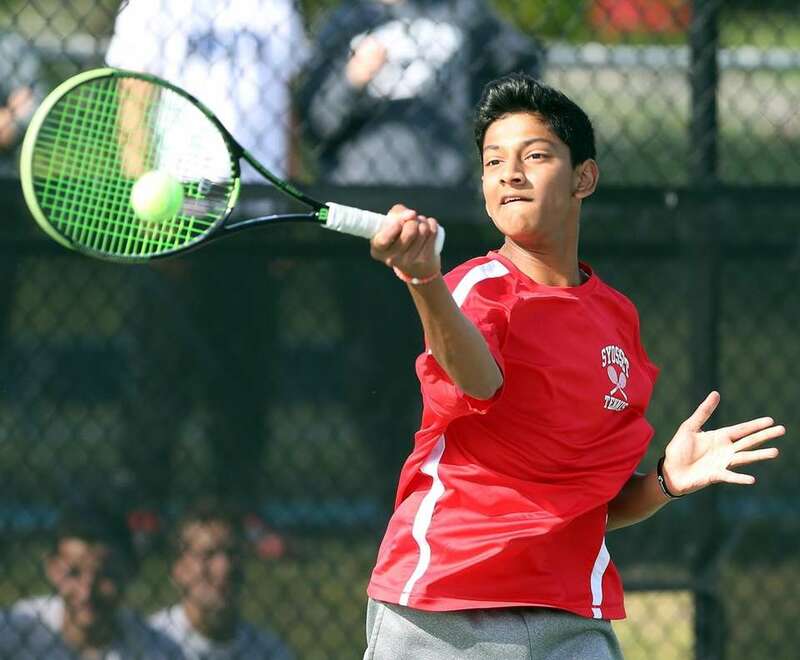 Syosset's Neel Rajesh as he plays against Roslyn's Dan Weitz on May 4, 2017. Newfield's Chandler Giovinco knocks the ball down off the bat of Smithtown East's Matt Tempone in the fourth inning on Wednesday May 3 , 2017 at Smithtown East High School. Matt Hogan of Hills East beats out the throw to second as Smithtown West's Erick Reuter tries to make the tag on May 2, 2017. 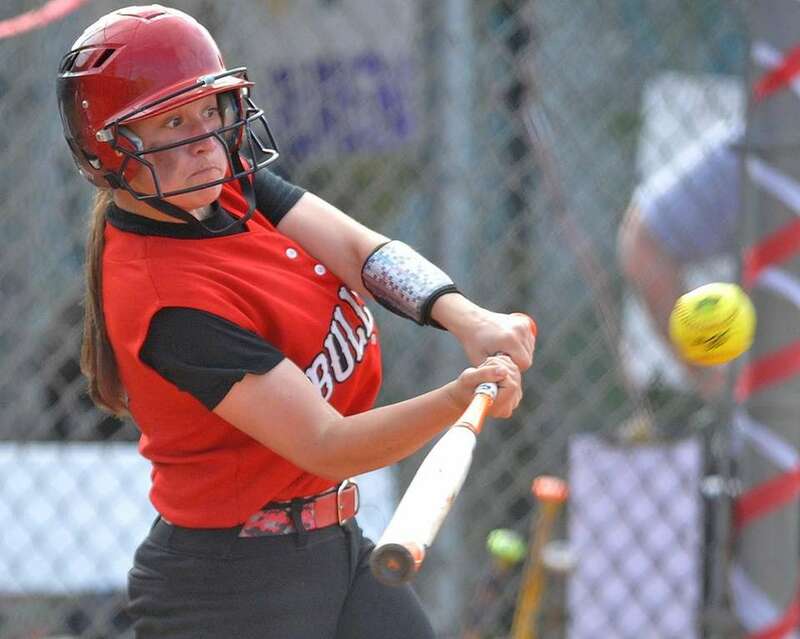 Commack's Kelly McKenna batting against Sachem North on May 1, 2017. 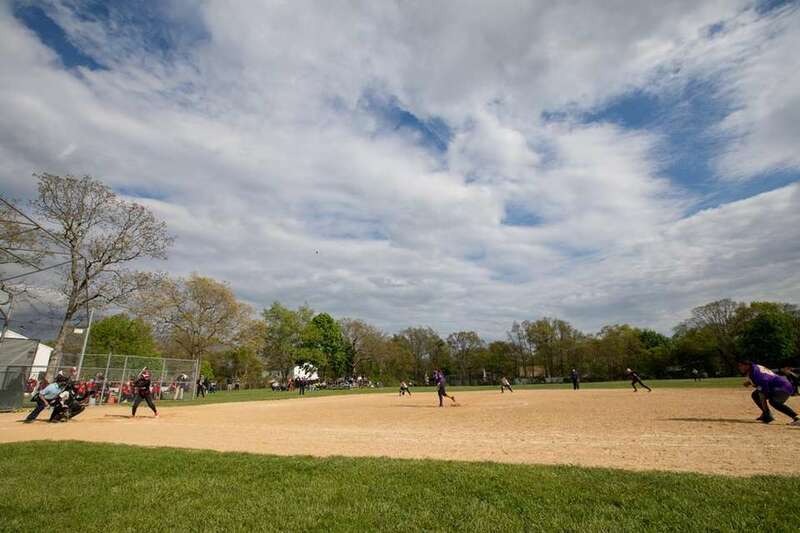 Megan Anderson, Island Trees catcher, connects for a run-scoring triple in the top of the second inning against Plainedge at Schwarting Elementary School in North Massapequa on May 1, 2017. Plainedge won, 10-5. High school photos of the month: April 2017Our top photos from this month around LI fields. LI Class of 2017 college commitmentsA look at which colleges LI enior athletes have signed to play. LI Class of 2019 college commitmentsWhere this year's seniors will play next year.